Simple and super sophisticated, this delicate salad is a gorgeous introduction to a winter white gathering. 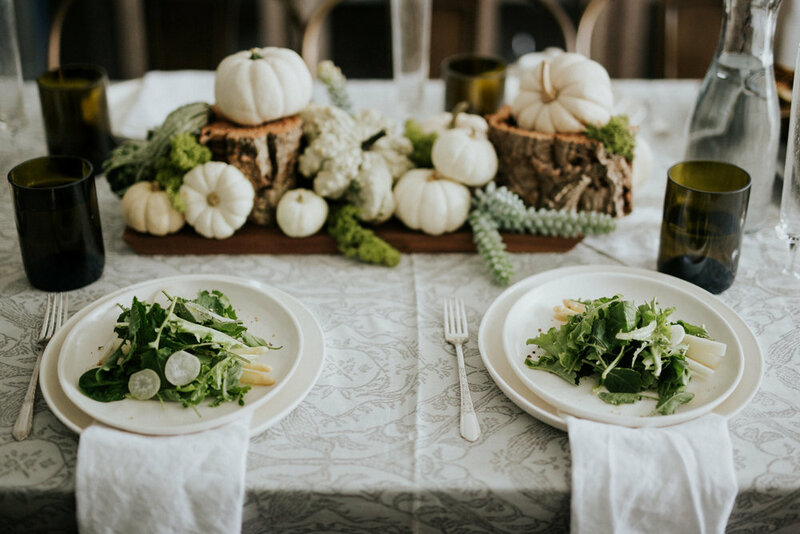 The white-hued radishes and asparagus are rare to the eye, sparking interest in the sense of detail you will display at your dinner party! Plate these ahead of time, as the salad is absolutely fine at room temperature. Its colors and textures will add another layer of precision to your tablescape. 1. In a small bowl, whisk lemon juice, Dijon, white balsamic, salt and pepper to taste. Slowly add olive oil, vigorously mixing to emulsify the vinaigrette. Set aside. 2. Bring a small pot of salted water to a boil. Meanwhile, prepare an ice bath next to the stovetop. Throw in asparagus, blanching for 2 minutes until bendy; immediately plunge into the ice bath to stop cooking. Drain water and dry asparagus. 3. To arrange salad, place 3-4 asparagus on each plate, topped with 1 cup of baby kale. Stud each salad with white radish slices, then pour dressing atop. Sprinkle each salad with sea salt and black pepper.